Perhaps my use of euphemism paid off this last Saturday. Seventeen women showed up at 8:00 am Saturday morning to engage in the “monthly climbing challenge”. I imagine it would have been significantly less if I had persisted in my tendency to call these rides “suffer fests” (although technically, this was “Suffer Fest #2”). 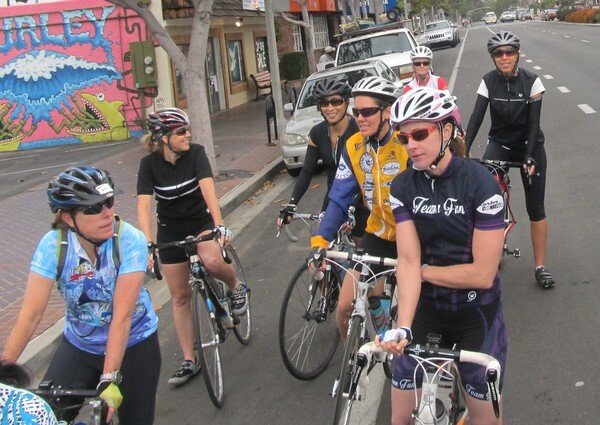 The hill challenges in front of us were no small feats: all groups were set to climb the grind of Alga Road, with the B group adding a San Elijo ascent (with possible Double Peak), and the A group… well, I’ll tell their story in a minute. 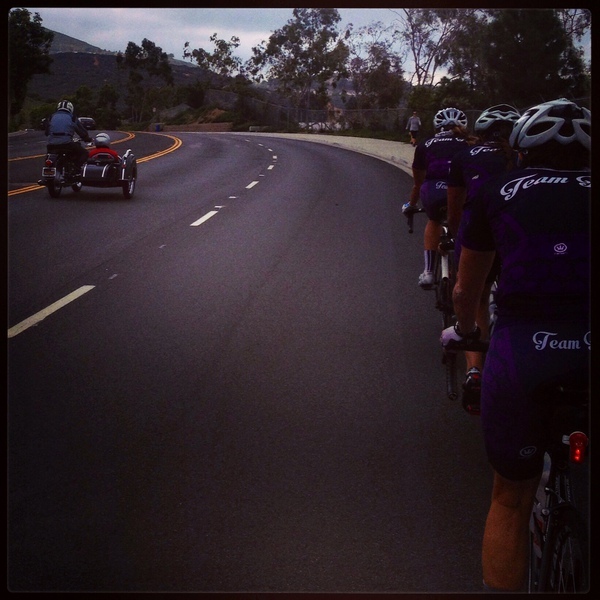 “Team Fun was doing some hills riding today and we had quite a good turn out! 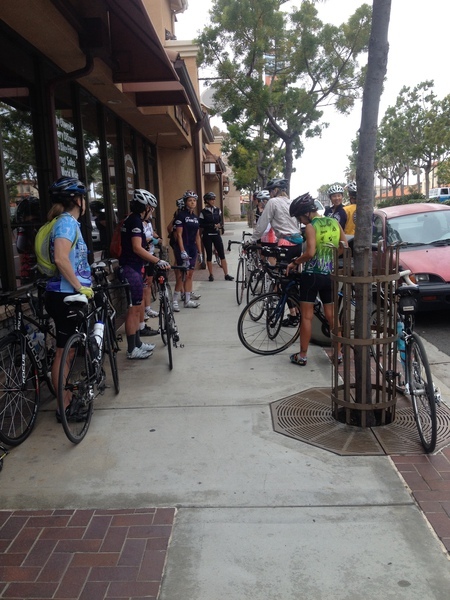 I’m afraid I set a bit too fast a pace for B group on Aviara – Alga hill and the group just sort of blew to bits. Luckily we shared the beginning portion of the route with C group, so Kim and crew kindly swept two B groupers back up to me at the Alga/Melrose regroup spot. Our courses diverged at that point and Dee, who started with the C group decided to defect in order to have a go at San Elijo hill. I was very happy to demand that everybody wait up at the top of the climb and rode up toward the rear of the group – read ‘much more leisurely pace’ – instead (being group leader for the day has its perks, you see. Bwahaha). As the leader of the group engaging in a true, out-n-out suffer fest, I fear that I received a few less accolades. Well, that’s not entirely true – after the oxygen returned to their brains and some feeling in their quads, my group members managed to see the silver lining through all the pain and suffering. So how bad was it really? Oh, not so bad, really. We started off at a very relaxing pace, enjoying the same route as the other groups – up Poinsettia, and with a right turn on Aviara Parkway, headed over for our first climb – Alga. “Tell me the others are about like this,” Kim asks me as we near the top of the 10% portion of the Alga climb. “Oh no, they are all much worse. In fact, the next one I hate the most.” I respond. There were a few exclamations from my regular riding partners, Heather K and Jill, “blah blah blah … heavy breathing… too fast…blah blah blah”. It was hard to hear, so we just continued on. Some of the group members were already claiming it was stiflingly hot, but we were fortunate to still have overcast skies at this point. Some bibs were de-shouldered, a couple of snacks consumed, and we continued on. Next up, climb Alicante from Poinsettia (the easy side, up and over to where it literally “flips up” to become El Fuerte. Say “El Fuerte Flipside”, and many a North County Strava aficionado will shudder in horror. With the first 1/3 or so topping out at an average of 10% (with some grades closer to 15%), this little gem is only a favorite of the absurdly strong (and I might add, the skinny). We all made it up this hill, retreating into our own private mental spaces, and regrouped on Alga before continuing on. Everyone seemed fine, a little taxed, but fine. You know, “Fine” in the way you might respond to someone who asks you how you are doing in the middle of a root canal. We took our time getting over to San Elijo and managed to ease our way up the hill without too much trouble. More snacks were consumed, and then we descended to… you guessed it… climb right back up that thing. The ladies in front of me kept suggesting that we turn around to re-ascend at any of the lights on the way down, but I assured them the intent was to go all the way down. Oh, Twin Oaks Valley Road! You are just steep enough to make it nearly impossible to settle in and spin up you. Why can’t you be nicer like your sister on the west side of the hill? You’d think that 1% average grade difference wouldn’t be too noticeable, oh, but it is. The breathing got a little harder, the faces a little redder, but after some time, the five of us re-grouped at the fire station in preparation for the next challenge … Double Peak. There was a lot of talk about Double Peak before and during the ride, about it perhaps being an unnecessary component to the ride, you know, so easily skippable. A suffer fest in North County wouldn’t be a suffer fest without at least ONE jaunt up Double Peak. Even my husband (who has a 5:00 time for this segment) talks about this being a tricky road – it starts fairly steep, levels out for a while, and then has about three “steps” as you approach and round the turn that get increasingly steep with each step. You need a plan of attack, and you need some determination to make it up this road strong. Many a heart has sunk when it’s already beating near max and you round the turn and stare down the sometimes near 20% grade in front of you. I’m proud to say everyone made it to the top, we re-filled or water bottles, but as a testament to how tired we were and focused on the remaining challenge ahead, we didn’t take a single picture (not even Jill!). The worst was definitely behind us at that point, and we only had a few bonus hills ahead of us (in addition to the normal rolling terrain just to return to the coast). I designed a special detour to make sure the group had the chance to take in the pleasure that is Hemingway – coming in at only 0.5 miles, but averaging 12%, you know this is going to be painful when you see the concrete (roads usually switch from asphalt to concrete when they get insanely steep). It was warm at this point, and there were a few grunts and some snacks consumed as we headed back toward El Camino Real and our last little hill challenge. “So you’re telling me we came over here just to do that hill?” Kim asks of Hemingway. “Yes,” I respond, looking a little nervous as the animosity seemed to be rising in the group. So, um, yeah, I heeded that threat and we eased our way back to Carbon Connection at that point to finally call an end to the suffering. Oh, but for all their complaining, they all loved it! “Climbing isn’t so bad once you get to the top and forget about the pain. Thanks Team Fun for the ride. I would’ve never done that alone!” – Kim N.
I mentioned in the Meetup post that this ride was inspired by Strava’s Climbing Challenge. This latest climbing challenge involved a minimum of 7578 ft in 5 days, to celebrate the women’s stage race “from May 7th through the 11th,where 96 of the world’s fastest female cyclists will race up, down and around Britain during the inaugural Women’s Tour; a five day, 493.6 kilometer stage race”. Our group on Saturday managed to accomplish over 70% of the challenge in a single ride (the B group accomplished over 33% of the challenge). Jill, Heather K, and I decided to go truly over the top with the climbing challenge this year, and having gotten close to the top 10 in the world for female Strava users on past challenges, we decided to aim even higher this time. 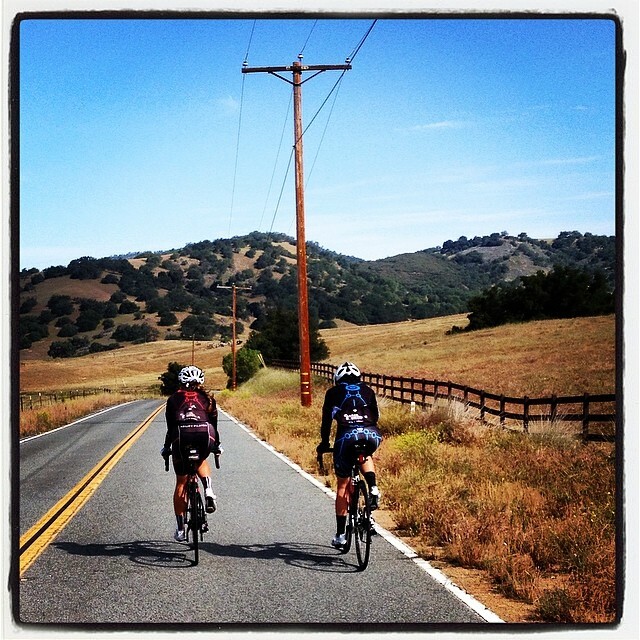 We spent most of the last five days, aside from the time we spent eating, sleeping, working and caring for our families, crawling up and down the west side of San Elijo – sometimes as many as seven times in a ride. There was even a ride that involved two full ascents of Double Peak. We had grand plans of including a Palomar East Grade ascent in our weekly portfolio, but Heather’s wheel was not cooperating and we ended up back on the old standy, Elfin to Ledge. My personal goal was to achieve about 5,000 ft/day, and we all met the goal with approximately 25,000-29,000 feet of climbing. There was a lot of “I never thought I could do this” sentiments, and at least on my part, what seemed like a lot of food consumed. Nothing compares to “slow climbing” day after day – the training impact is amazing – and somehow, in spite of all of the pain, you manage to have a great time doing it. 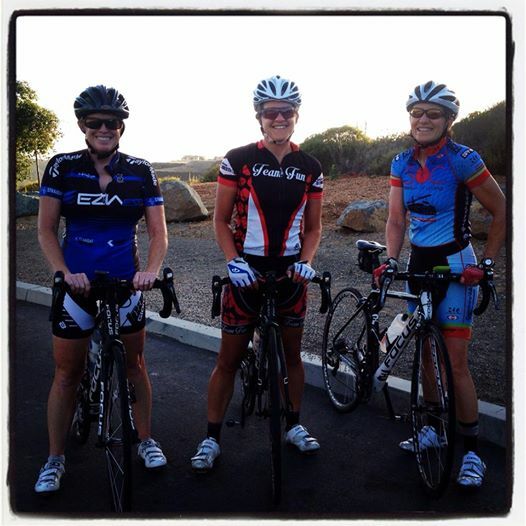 Love the picture of Heather K with our standard Heather B sentiment and Heather B all smiles.